Work in progress at the Eighth referendum count at the Oakwood Arms Hotel, Shannon. Photograph by John Kelly. Updates from the Clare count centre in Shannon following Friday’s vote on the Eighth Amendment. 2.50pm That concludes today’s updates from the Shannon count centre, it has certainly been a resounding yes vote in Clare. For full in depth analysis of the referendum in the county make sure to pick up next week’s Clare Champion. 2:46pm Clare has voted yes. From an electorate of 83,225 there was a total valid poll of 53,407 with 34,328 in favour of the proposal and 19,079 against. This means Clare voted yes by 64.2% to 35.8%. The announcement was greeted with cheers of approval from the remaining yes campaigners in the count centre. 2:33pm Counting complete here, but the returning officer needs the all clear from Dublin before making an announcement. and Seamus Ryan at the Eighth referendum count at the Oakwood Arms Hotel, Shannon. Photograph by John Kelly. 1.29pm SeamusRyan was involved in the preparation of the tallies at today’s count, having spent the last number of weeks campaigning for Together for Yes. 1:20pm A preliminary count puts the percentage turnout in Clare at 63.83%, showing that more people voted in this referendum than in the marriage equality referendum when the turnout was 59.4%. According to Clare’s returning officer, Pat Wallace preliminary figures show that of the 83,225 people eligible to vote in this referendum 53,129 votes were cast in Clare yesterday. 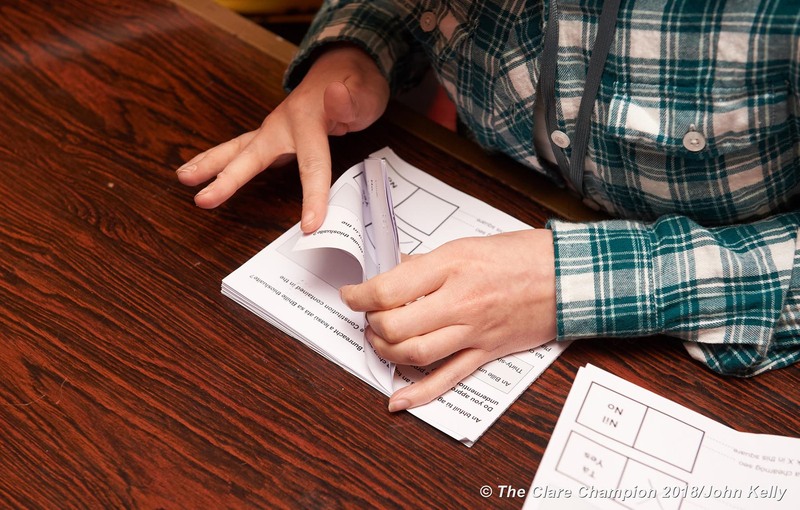 The turnout for the marriage equality referendum in Clare was at 59.4% 48,627 out of a total of an electorate of 81,809. 1:03pm Things are quiet now in the count centre with the tallies over and the final count being prepared. There are still some yes campaigners around the hotel, but no campaigners have been very thin on the ground here. Pat Breen, T.D. at the Eighth referendum count at the Oakwood Arms Hotel, Shannon. Photograph by John Kelly. 12:52pm Minister of State for Trade, Employment, Business, EU Digital Single Market and Data Protection, Pat Breen has said “I didn’t give a yes or no for the simple reason that it is the people’s referendum and it was up to the people to decide in relation to this, now the people have decided”. 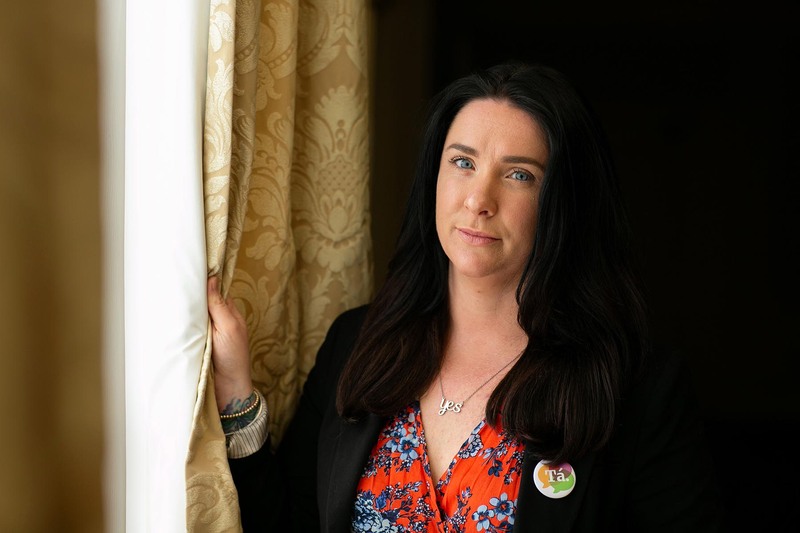 “I always felt that the eighth amendment should be taken out of the constitution, I think that was important because we have seen so much misinterpretation of the eighth amendment by medics, and the Savita case is the one we all know, but there are other cases as well. It was always better that we do this in legislation,” Deputy Breen said. 12:40pm The tallies are over, counting continues, it’ll be a while before we have final figures, but there’s no mystery about it, the yes side will win comfortably. 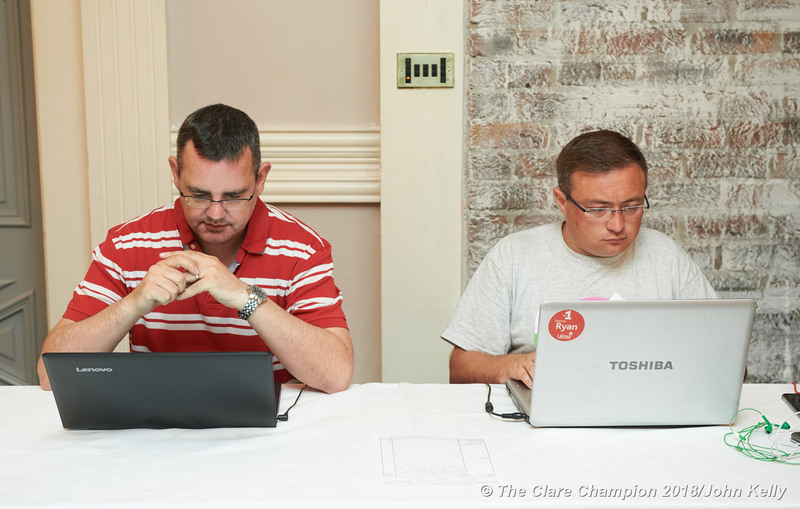 12:09 Tallies are almost completely finished and they predict the yes side will take 64% of the vote in Clare. Boxes are emptied at the Eighth referendum count at the Oakwood Arms Hotel, Shannon. Photograph by John Kelly. 11:53am St Senan’s Kilrush voted in favour by 92 to 81, while Ballinruan had 91 voters in favour and 67 against. A box from Cloughleigh had 197 yes votes and 145 against. 11:46am More tallies are in, all showing a yes vote. Cooraclare voted yes by 221 to 146. 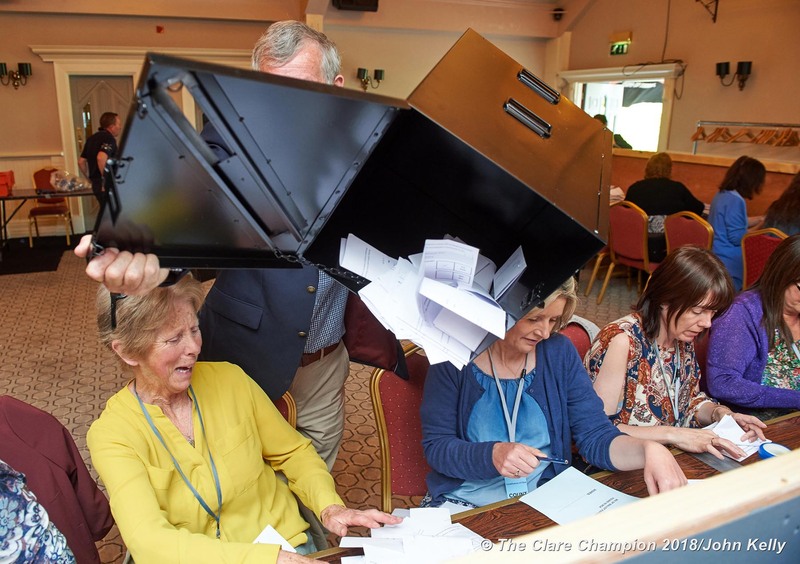 A box in Clarecastle was in favour by 263 to 144 and one at Drumbiggle by 263 to 108. One hundred and fourteen boxes are now open, and almost two thirds of votes were for the yes side. 11:24am With just under 100 boxes opened, tallies indicate a 64% yes vote with 36% against. 11:19am More tallies in, all showing yes majorities. Mullagh 88 yes, 74 no; Lisdoonvarna 127 yes, 55 no; Tubber 130 yes, 62 no; Toonagh 291 yes, 215 no. 11:14am The vote from Bansha is now coming in at 83 Yes to 63 No despite earlier tallies suggesting the area voted No. 11:10am Geraldine Gregan Equality Officer for Clare Fine Gael has said she is delighted with the expected yes vote from Clare. 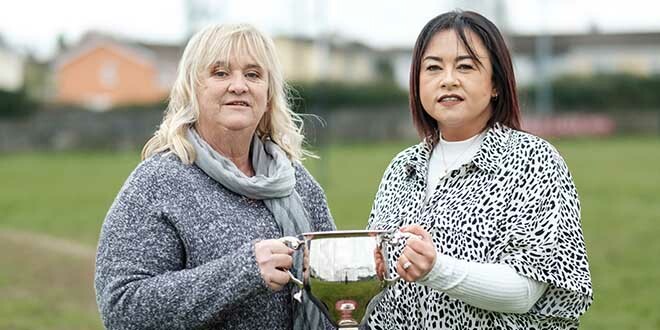 “The result is great for Irish women and society in general. I believe that political leadership was a key element in getting this result. Much thanks are due to the electorate for showing compassion and understanding towards Irish women”. 10:55am Some more tallies have come in, all showing a yes vote. 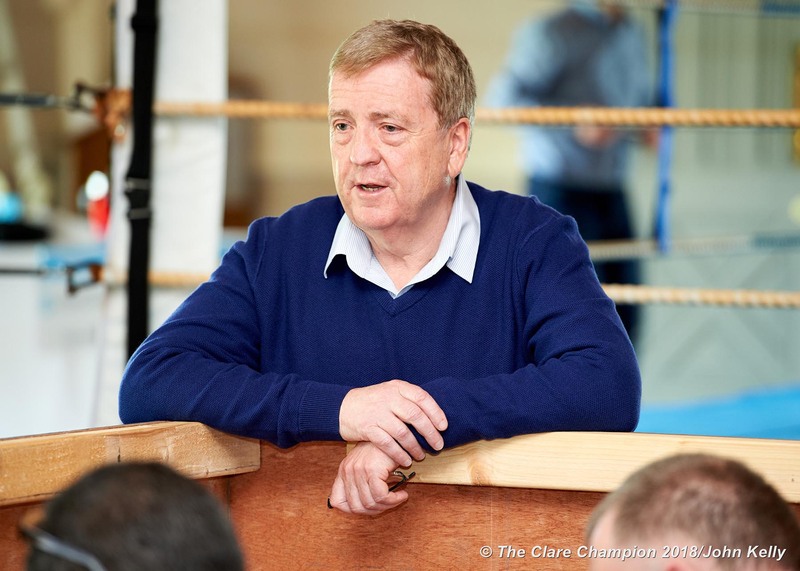 Cratloe box number 2 was 196 in favour and 94 against, St Conaire’s box 63 was 157 for and 85 against, Kilnamona had 192 in favour and 124 against and Ennis had 298 in favour and 167 against. 10:41am With 70 boxes opened, latest tallies show 64% for yes and 36% for no. 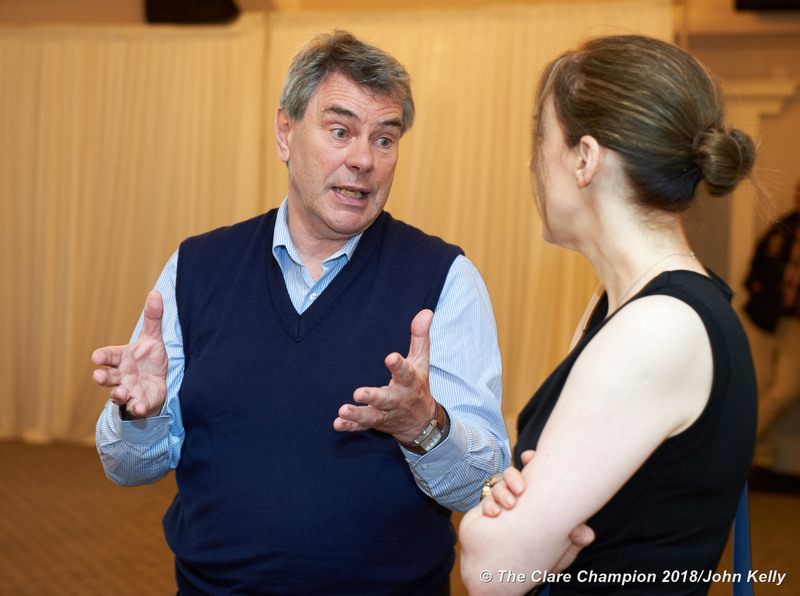 TD Michael Harty chatting with Claire Gallagher at the Eighth referendum count at the Oakwood Arms Hotel, Shannon. Photograph by John Kelly. 10:38am Clare TD Michael Harty has expressed surprise at the strength of the yes vote.”I’m actually stunned at the percentage. People were looking at something like 55-45 but now it looks like almost 70-30 which is a stunning achievement.” He said that people may have been reluctant to tell pollsters their true views in the run up to the vote. 10.33am Tallies indicate a no vote in Labasheeda, with 97 no votes, 94 yes and one spoiled. This is only the third place in the county in which tallies indicate the no vote was in the majority. 10:23am Tallies show that Quilty has voted yes by 199 votes to 173, Mountshannon by 219 to 111, Flagmount by 112 to 82 and Ballycar by 211 to 102. 10.13am In West Clare the tally for Kilrush is showing almost a 50/50 split, with tallies suggesting a vote of 53% in favour with 47% against. Fine Gael Senator Martin Conway says this is reflective of the canvassing carried out in this area where the no vote was strong. 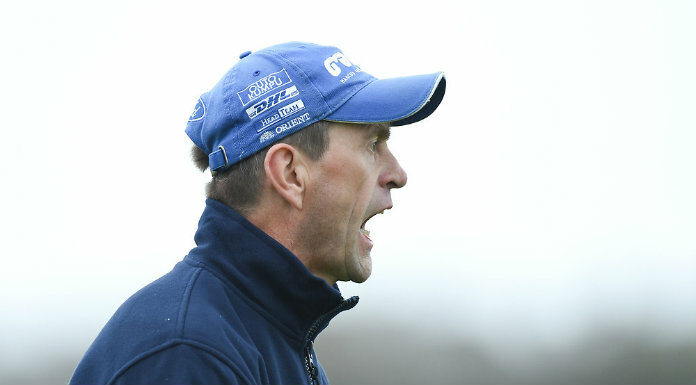 He added that he was surprised not to see a no box being tallied from Kilrush as yet. Contrastly the rural parts of West Clare are showing a majority yes vote, with polling stations in Cranny reporting a tally of 119 in favour to 94 against. 10:10am With 43 boxes now tallied the vote in Clare is coming in at 64% to 36%. Areas to have voted yes include Clonlara polling stations 1 and 2, Flagmount, Miltown Malbay, Moy, Doonbeg and Cranny. 9:59am With 9,235 votes tallied, there are approximately 5,735 votes in favour and 3,500 against. That equates to 62% in favour and 38% against. 9.54am Tallies suggest that 5,300 people in Clare so far have said yes, with 3,500 saying no. 9.52am 28 boxes are now tallied and show 64% voting in favour with 36% against. 9.49am Tallies for two boxes of the postal vote in Clare, which includes nursing homes, are in. The first shows 93 yes and 85 no, the second 135 yes, and 122 no. 9.39am Tallies indicate yes votes in Carrigaholt, Cross, Moyasta and Clonmoney, while boxes opened in Shannon and Ennis indicate Clare’s two biggest towns voted yes. 9.34am 21 boxes are now opened, 19 have shown majorities in favour of the amendment, with Bansha (near Kilkee) voting against, as well as Furglan. In both cases the margin was quite narrow. 9.29am Fifteen boxes are now tallied, they show 60% voting in favour and 40% against. Only one of the boxes, Furglan, had a majority no vote. 9.25am We expect to have initial tallies within a few minutes. 9.17am Speaking to some Gardai here this morning, they say a huge amount of young voters came in to Garda stations looking to register to vote in the lead up to the referendum. 9.14am Senator Martin Conway is here at the count centre, having campaigned for a yes vote. 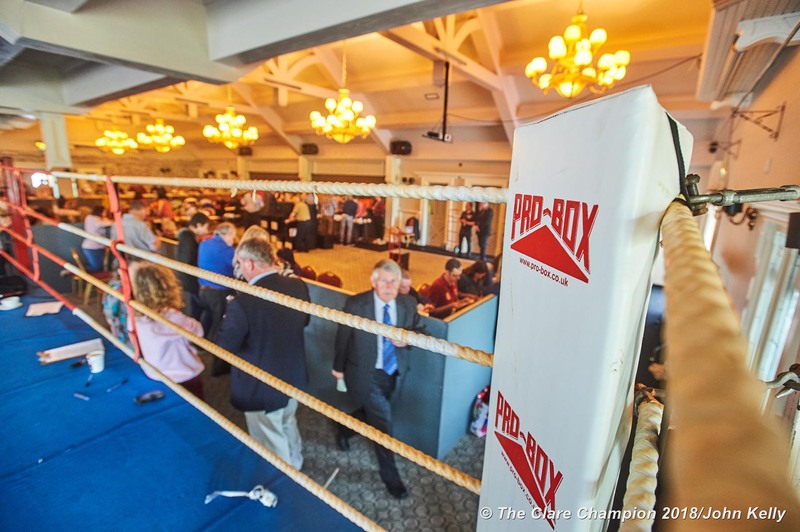 The Eighth referendum count shares the room with a boxing ring at the Oakwood Arms Hotel, Shannon. Photograph by John Kelly. 9.05am Oddly enough there is a boxing ring set up in the same room as the count centre! 9am Good morning from the Clare count centre at the Oakwood Hotel in Shannon,where counting is about to begin. Exit polls have predicted a large majority voting for the repeal of the Eighth Amendment and its expected Clare will follow the trend. In a rare show of unity, both the no and yes campaigns are co-operating to carry out tallies this morning.